Creation of an Irish Target Pistol Team based on the GP85 discipline. This will create both a Smallbore and Centrefire team to compete in the first International match scheduled for the Irish Open in July. Target shotgun will field two teams in Semi and Manual categories. 50m Pistol Precision disciplines we will offered alongside 50m Gallery Rifle. M1 1020 will be trialled this year, rifles shot as issued with iron sights. Classic Gallery Rifle Centrefire, also shot in the spirit of the originals, iron sights only. 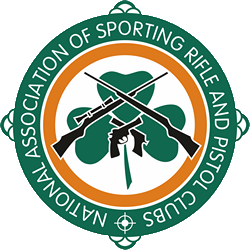 Open Field Sporting, full details from the Sporting Rifle Working Group below. Dates for the quarterly meetings have been set for the 15th of May, 15th of August, and the 15th of November in Portlaoise. The AGM has been set for the 29th of January 2020, location to be confirmed at a later date. All dates are populated in the NASRPC events calendar. The Prone Rifle Working Group have just completed its review of the Sporting Rifle Rules for 50m and 100m competitions. Our previous review in 2017, attempted to introduce more shooters to the sport of prone shooting. Part of our strategy then was to entice shooters who had shot in the past but were unable to ‘suit up’ due to injury or age related issues. We also wanted to entice field shooters into the sport of prone shooting through a new Field Sporting Class. Opening up the discipline has definitely increased the number of competitors and provided them with top class competition, most medals are won on single point scores or X count. Following a number of competitor queries specifically surrounding the Field Sporting class, it was decided to provide clarity in all classes with regard to rifle weight, action type, front and back rests and vertical and horizontal adjustments. The review identified the need to introduce a new Open Field Sporting Class which will probably suit the purists among us. The review group has defined the correct target for use in 100m Prone competitions. Last year 6 ring 50m targets were used in error at the first 100m competition and were used throughout 2018. The new target will be a large 3 ring one with one ring for sighting in. 10 rounds on each of the other 2 rings will be used for scoring. All targets will be of a matt design, avoiding issues with shimmer and shine on the glossy type used last year which shooters experienced in strong sunlight or patchy rainy conditions. All detail times increase from 15 to 20 minutes. We would like to thank those shooters who brought us queries and solutions, and the review group for their work in amending the rules to suit as many shooters as possible. See the rules and quick reference table below for further info. The working group has completed a review and passed its recommendation to the committee. The recommendation is to apply the substitute positions listed in the rule book at National Competitions. This will apply to all disciplines for the 2019 season. We would also like to thank all involved for their work in this area. In summary, the rule outlines the following alternative shooting positions for those with disabilities. Karl O’Brien and Frank Feeney have written a comprehensive guide for anyone traveling to Bisley in the UK for the first time. Last year a large contingent of Irish shooters descended on the camp for the Phoenix match which took place in ideal conditions with temperatures up to 30°C. Karl is a seasoned Bisley shooter and Frank was a first timer in 2018. The guide covers registration, ferry and airline travel information, dealing with security and customs, Bisley camp, registration, facilities, food and drink, competition and dining etiquette, and it also contains a number of checklists first timer shooters might find useful.